* Members can submit more than one voucher on playoff dates. * However member must participate in main session bingo in order to play in the playoff. 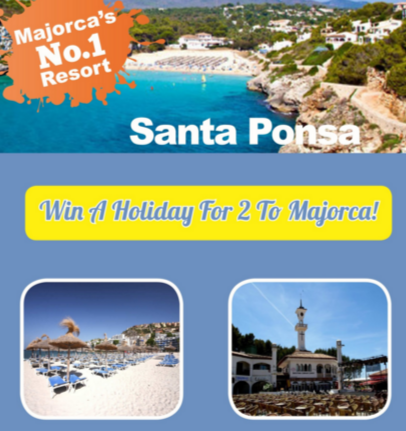 * The Majorca Holiday prize is a holiday for two people to Santa Ponsa, Majorca. Travelling on Sunday 4th September 2016 & returning Sunday 11th September '16. * Prize includes return coach travel from club to airport. Flying from Bournemouth International Airport. All Inclusive. New Century Bingo Management holiday reps.
* Holiday does not include extra meals, gaming or excursions. * Winners will be accompanied by management for the duration of the trip. * Winners must be over 18. * Any management decision is final. * The Directors and Management of New Century Bingo reserve the right to refuse any winners without reason. * All holidaymakers must be deemed fit enough to travel. All must have travel insurance. * To play a strip of six at the playoffs each customer will need to present six vouchers when purchasing books. Players can play more than 6 should they wish, depending on the number of vouchers. * The playoff will be a 2 line game. In the result of there being more than one winner, the 2 line winners will then continue playing for the full house. * There is no cash alternative to the holiday. * Managers decision is final.